Yes, here's your chance to wear one of these cool wristbands! 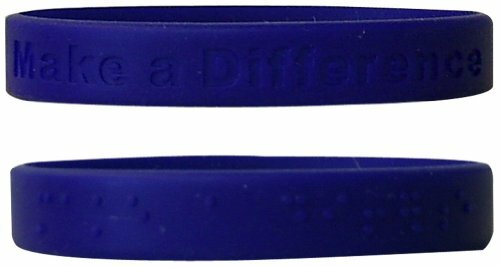 This is a set of eight bracelets, each produced with a different message in print and raised Braille, and each saying comes in a different color. It's made of the regular, slightly-stretchy material, so it's easy to get on and off. Both attractive and affordable, one of these wristbands would make an awesome gift for anyone who enjoys wearing the greatest fassion ideas. We offer bands for kids or adults, and we will send you the adult size by default. If you would prefer the kids size, just send us an Email after you complete your purchase. Adult-sized Bands in this set: Believe (Dark Blue), Dream (Green), Friendship (Light Peach), Jesus is the Light (Light Yellow), Make a Difference (Navy Blue), One World (Dark Brown), Braille is Best (Medium Blue), and Alphabet (Light Blue). If you would prefer the Kid-sized Bands, you'll receive: Best Friends (Bright Red), COOL (sky-blue), God Loves You (Light Blue), I Feel Lucky (Forest Green), No Doubt (Light Orange), Social Butterfly (Hot Pink), Braille is Cool (Lime Green Glow-in-the-Dark), Alphabet (Turquoise Glow-in-the-Dark).